The idyllic village of St. GGilgen lies just a few kilometers east of Salzburg, on the northwestern tip of Lake Wolfgang. The Dachau concentration camp commander Hans Loritz bought a large plot here in April 1938. 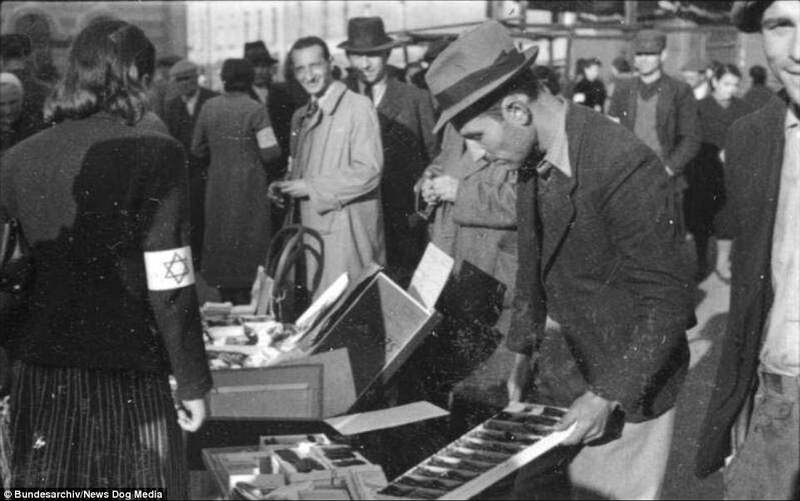 Only a short time after his purchase, he had nine Jehovah's Witnesses and one Polish prisoner among the Dachau concentration camp inmates selected for the first time and brought them to Lake Wolfgangsee. 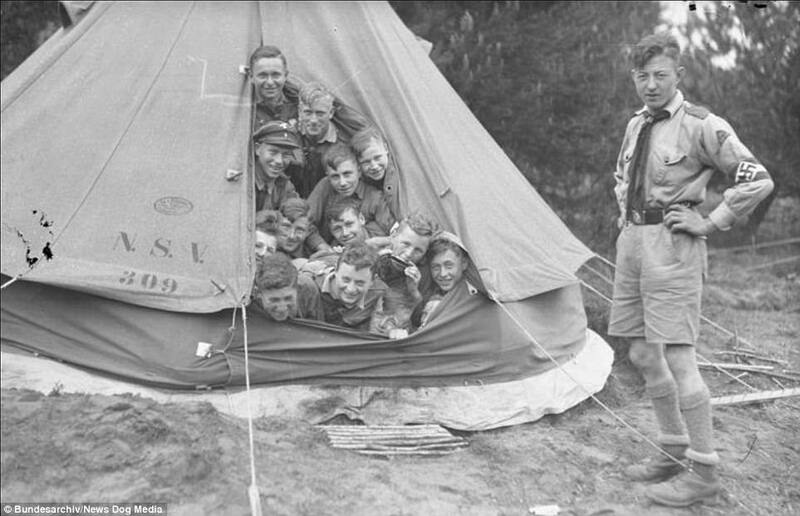 Officially, the SS leader disguised the trip as a transport to a new sub-camp at St. Gilgen. 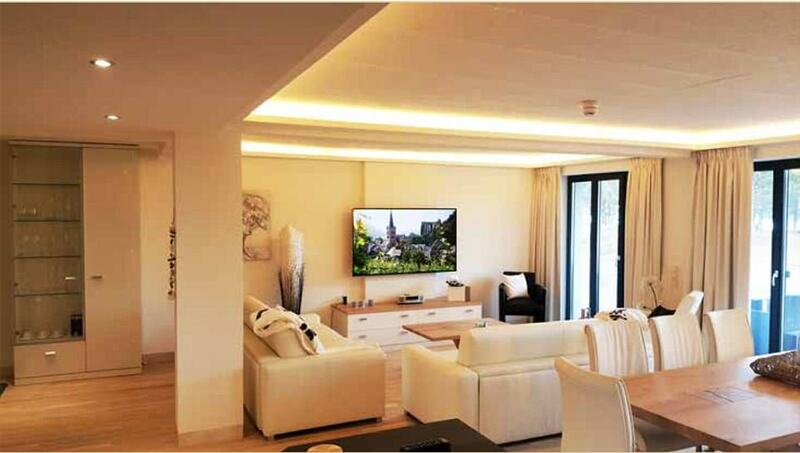 In fact, the prisoners had to start preparing for the construction of a private villa for Loritz. The directory of the holding camps under the Reichsführer SS of the International Search Service does mentions the use of prisoners at a concentration camp at St Wolfgang. According to this source, the prisoners had to build the country house here for a concentration camp commander loritz suggests that, this is a simple name confusion with St. Gilgen am Wolfgangsee. For the night, the SS guards locked up the forced laborers into the local Gilgen jail cells. 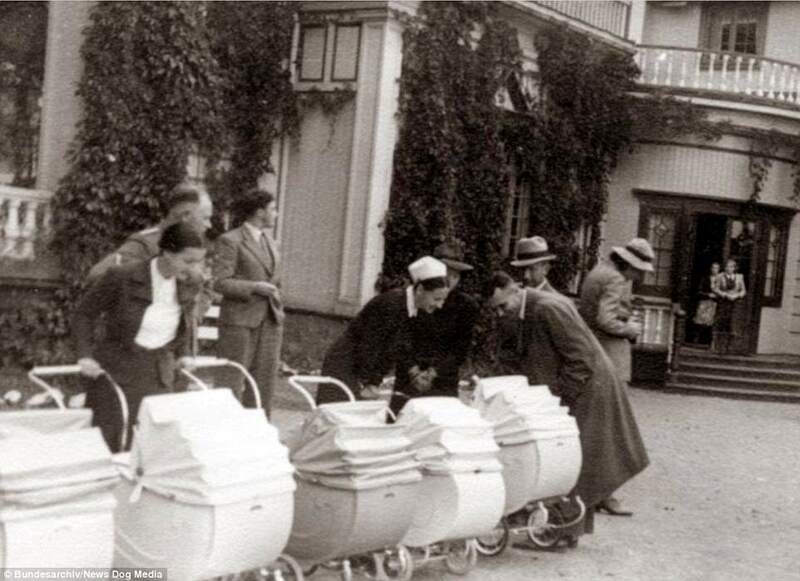 The public of the place were well aware of the use of concentration camp inmates, for example, the arrival and departure of prisoner transports was recorded the municipal registry, and walkers who had stopped at the construction site were instructed to move on and away quickly. In December 1939, the concentration camp commander Hans Loritz - initially acting - took over the management of the Sachsenhausen Concentration Camp near Berlin. 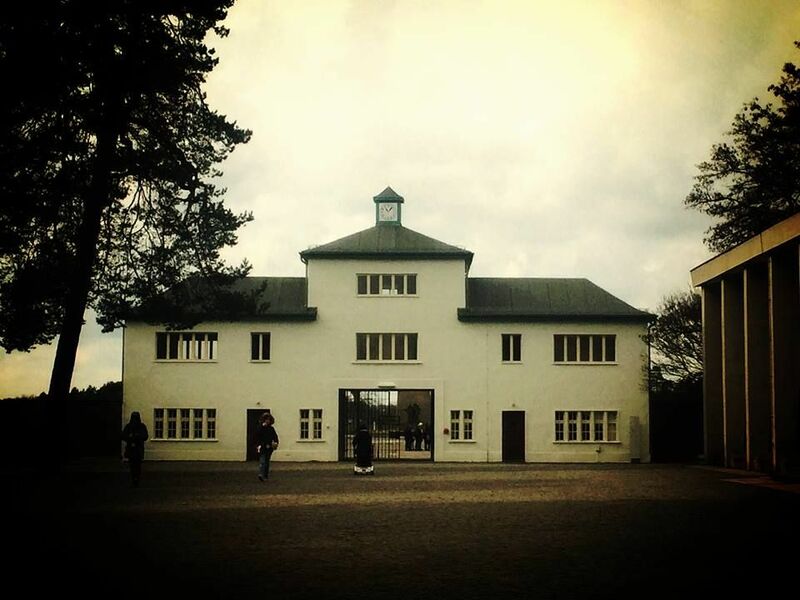 In late spring 1941 Sachsenhausen prisoners therefore had to continue their work in St Gilgen. 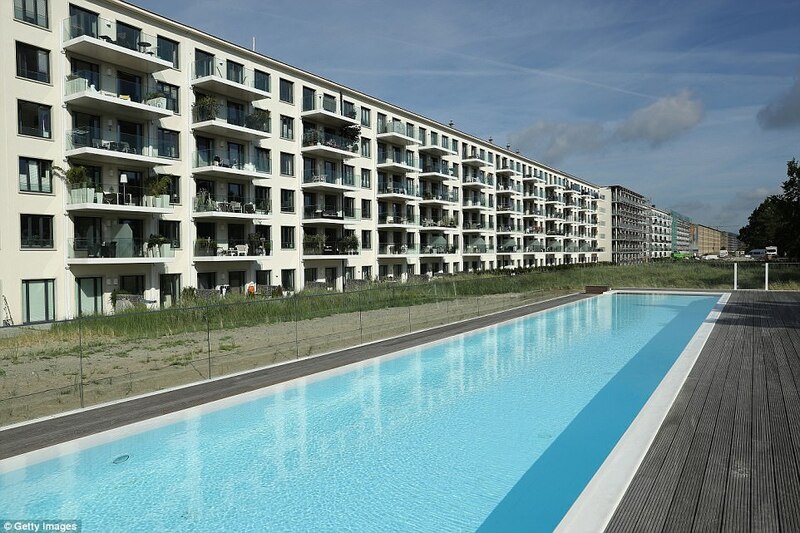 However, because the sub-camp in Salzburger Land was officially still run as a Dachau sub-camp, Loritz initially sent about 20 to 25 selected prisoners from the concentration camp Sachsenhausen to the concentration camp Dachau. These were mainly Jehovah's Witnesses with technical knowledge (in other words they were tradesmen). 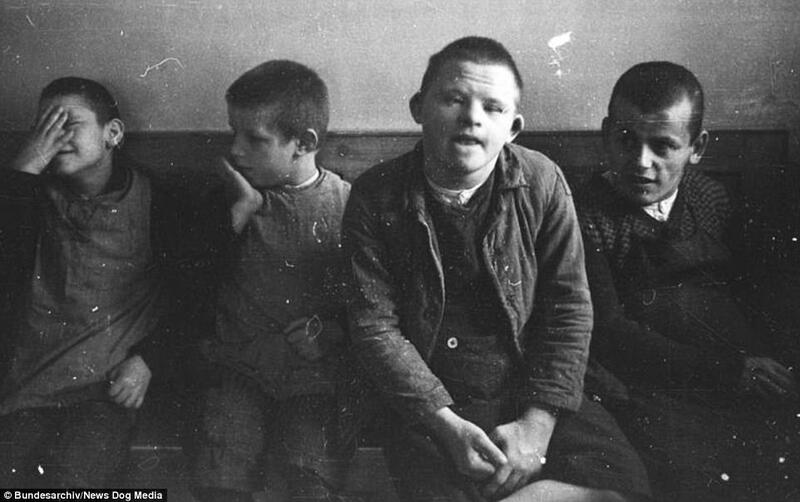 Since these prisoners were now also administrative wise under the SS authorities as Dachau prisoners, they could be transported a few days later into the sub-camp Gilgen. At the onset of winter, when the construction work was interrupted, the prisoners were then taken back to Dachau and transferred from here back to Sachsenhausen. In 1942 a prisoner transport went via Dachau to St Gilgen (Seems very confusing, sic) which took place by the same method. The working conditions at the Wolfgangsee described by the surviving KZ-prisoners very differently. Although the conditions on Lake Wolfgang were altogether bearable as compared to those in KZ-Sachsenhausen, this did not rule out lasting injuries to the prisoners.Thus, the SS Commander Trenkle severely mistreated several KZ-inmates because they could not carry out the strenuous construction work fast enough. 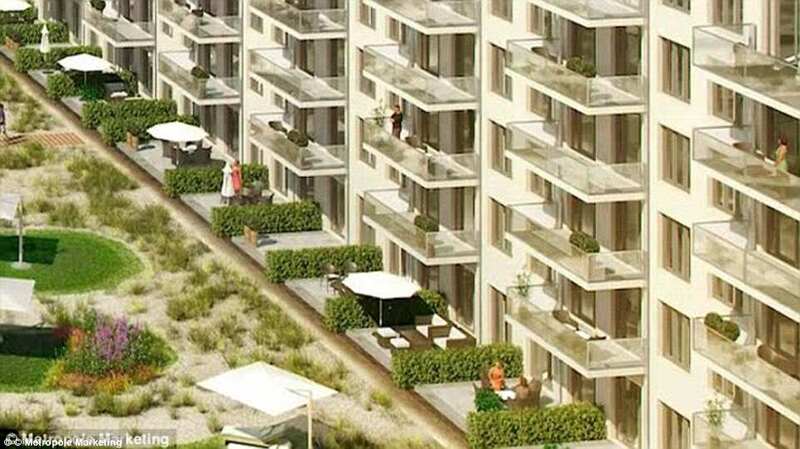 Loritz was not the only high-ranking SS officer who owned a property at the Wolfgandsee. Several former KZ-prisoners from St. Gilgen reported that from May to July 1942 they had to complete the construction, which had already begun, for Arthur Liebehenschels, head of the Central Office at the SS Economic Main Administration. 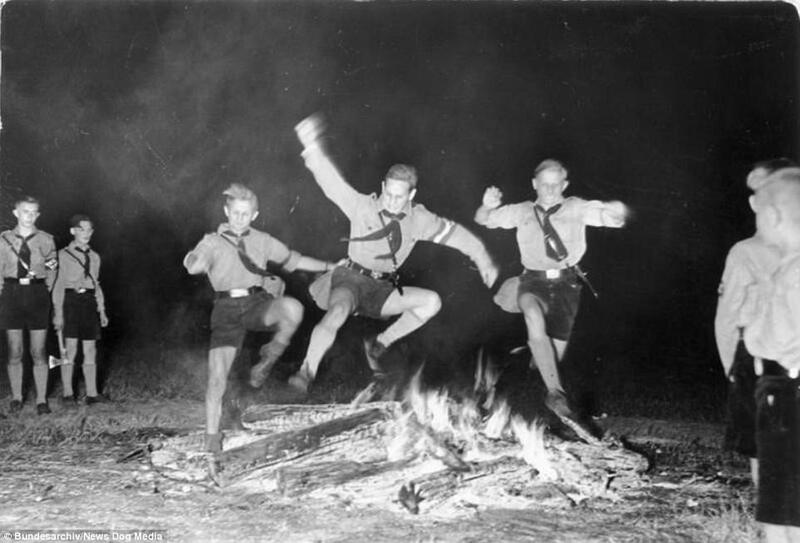 In the idyllic landscape of Salzburg, the SS-leaders saw here the rectification of their own blood and soil ideology. 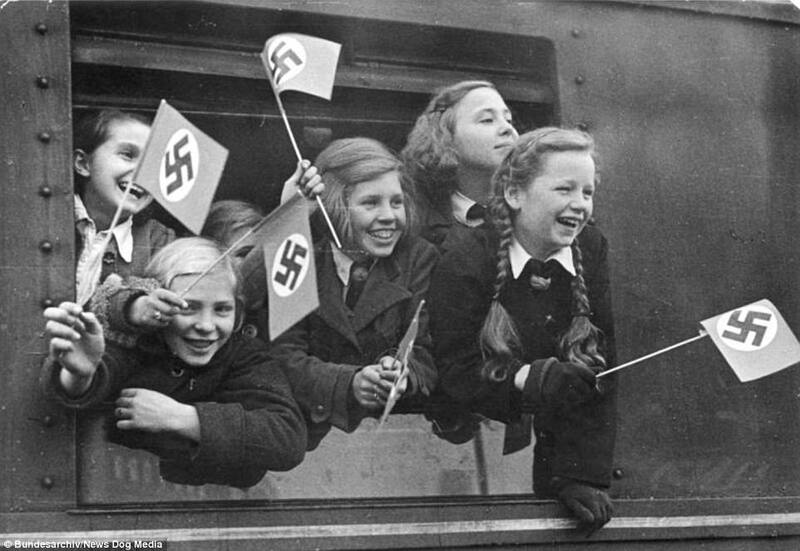 And while the German cities were increasingly the target of the Allied bombing raids during the Second World War, the families of the SS members were relatively safe in this rural idyll. he announcement of numerous corruption and private black-market buildings resulted in the summer of 1942 in a disciplinary proceedings against the KZ-commander Loritz. 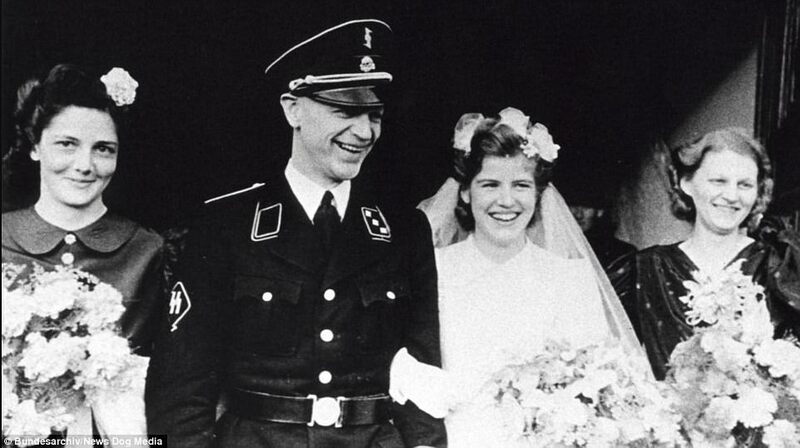 Following by his transfer to Norway for the duration of the war as the Higher SS and Police Leader. This ended the use of KZ-prisoners on the Wolfgangsee. Most of the prisoners were returned to KZ-Sachsenhausen. A smaller group, which stayed until the summer of 1942 had worked on Loritz 'garden, came to the KZ-Dachau. However, the spacious estate, where now the wife of the SS officer Loritz with two sons lived, remained in the possession of the family. After the end of the war, Loritz tried in vain to evade Allied jurisdiction under a false name. After being exposed, he took his own life at the internment camp in Neunmünster-Gadelang to await trial by the Soviets. The property established in St Gilgen by the KZ-prisoners was confiscated by the Republic of Austria in 1957 and sold to a private buyer. 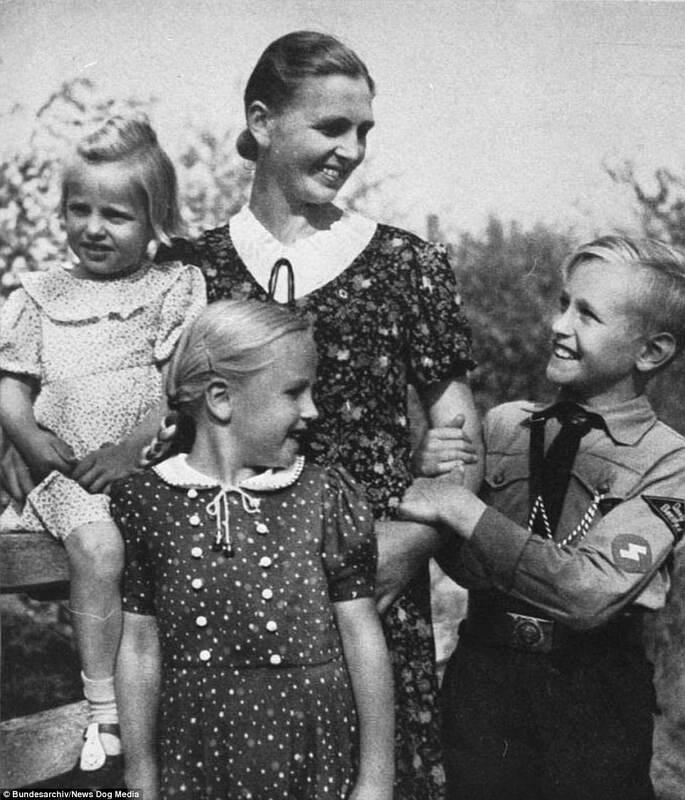 Loritz's widow soon returned to Germany with her children. 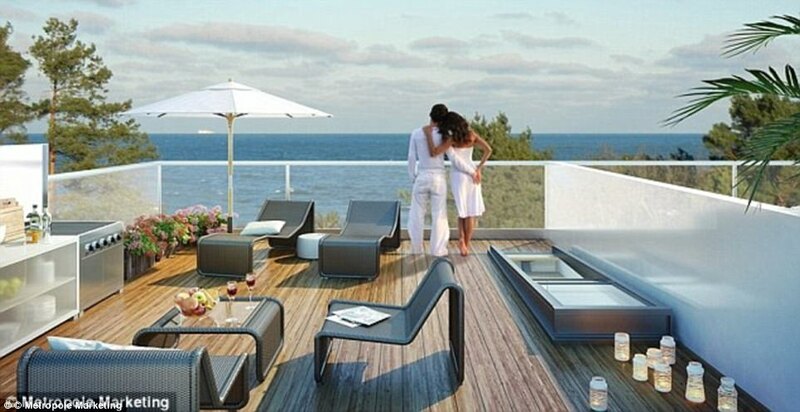 The villa of the former commander still exists today, but there is nothing reminiscent of the former sub-camp. 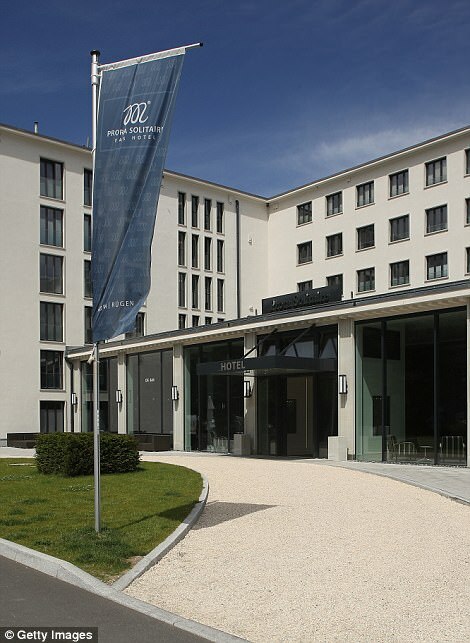 Since 1973, the office of the state justice administration for the investigation of National Socialist crimes in Ludwigsburg has been investigating the events in St Gilgen. 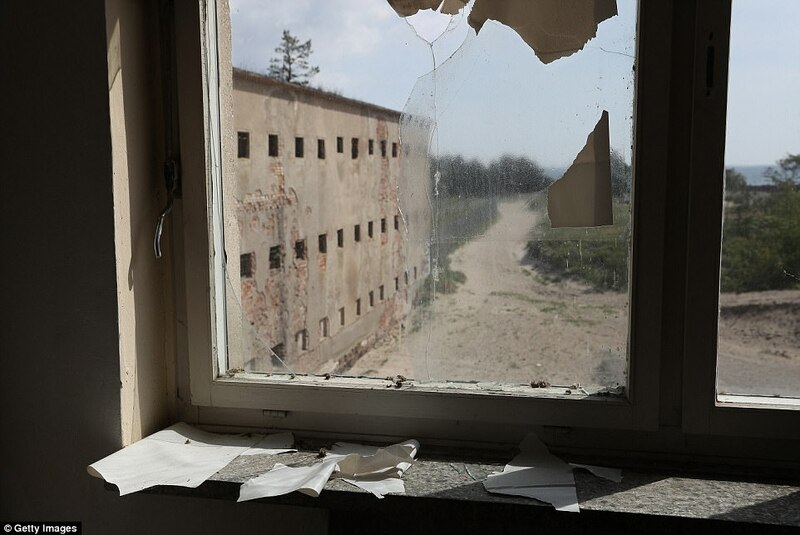 But since the testimonies of the former prisoners could not give any concrete evidence of torture or deaths in the former sub-camp and any other crimes, these were already considered to be dated, the preliminary investigations were closed in 1975. Rudolf Hess, the Führer's deputy, flew to Scotland on 10th Nay 1941 to negotiate peace. Unfortunately the Germa NS hierarchy dd not understand nor did they have little knowledge of the proceedings of a Parliamenty System in a Democracy. His flight was considered treachery by the National Socialist government, which declared Hess mentally deranged. Hitler was at Obersalzberg for a few days. 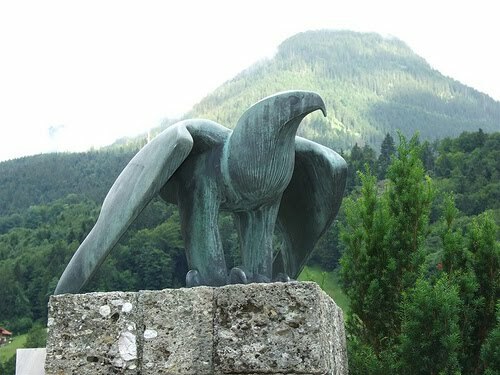 Hess was also staying at hiss house at the Obersalzberg and was invited for dinner at that evening to join him. 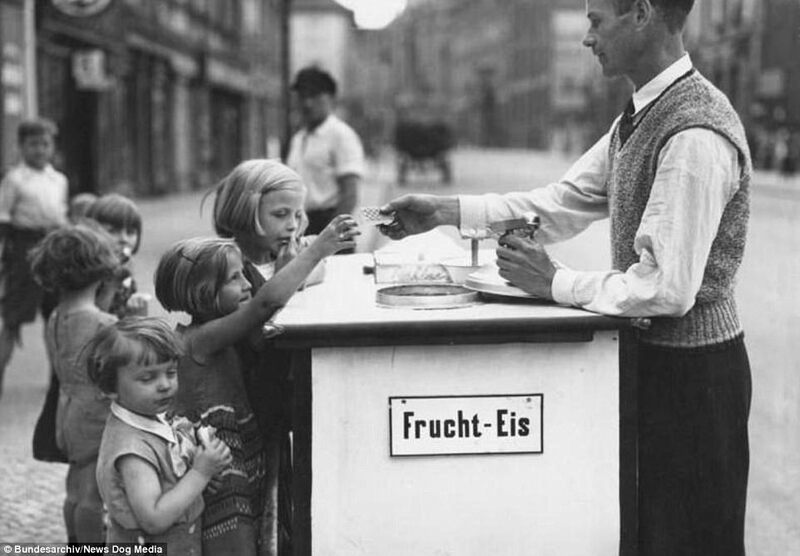 Towards the end of the meal a courier arrived and handed a despatch to Reich Press Chief Otto Dietrich. He run his eyes over it quickly and then passed it to Hitler, who read it standing up and the exclaimed: 'My God, what can I supposed to do? I can't fly over and beg on my knees'. Hess's servant Sepp Platzer after his imprisonment in Russia revealed, what happened next during the evening and how events panned out. Sepp drove back to his house with Hess, and in the car and repeated the sentence: 'Hitler cannot, but I can!' Then he let sepp into his plan . He decided to fly to Britain on his own account. Nobody else was to know - at first, not even his own adjutants. First of all Sepp had to obtain two British history books. Above all, however, Hess had to have knowledge about the flight safety zones, especially the code words, which were changed daily, so as to find the 'dead zones' and avoid coming under friendly flack fires. Sepp mentioned to to Flugkaputän Baur the map with the safety zones marked out on it. At first Baur declined the request. Sepp insisted . 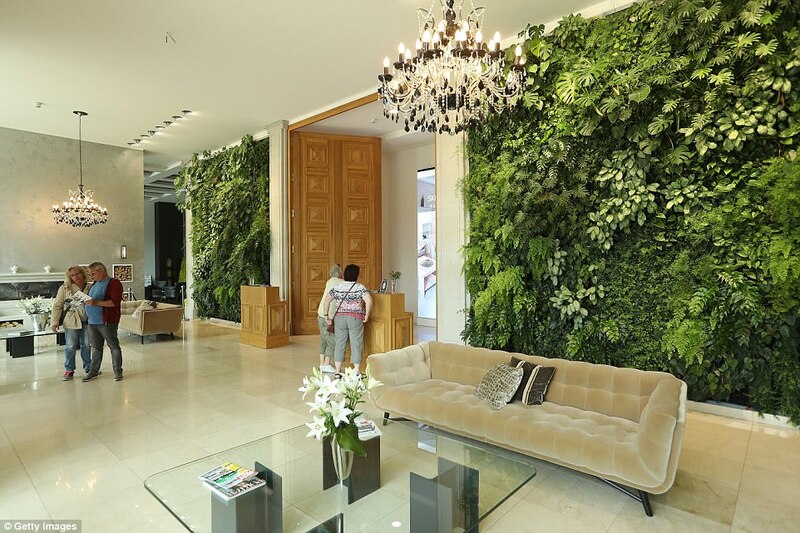 'You know my boss, he wants to be informed about everything .' 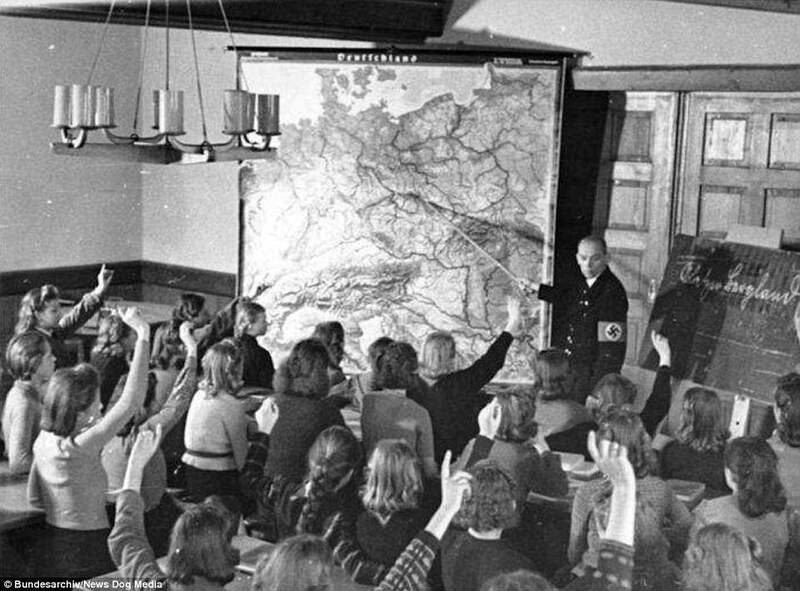 Baur then obtained a copy from Göring, commander-in-chief of the Luftwaffe, on the pretext that the map was needed by his deputy, Hitler's second pilot, Georg Betz. 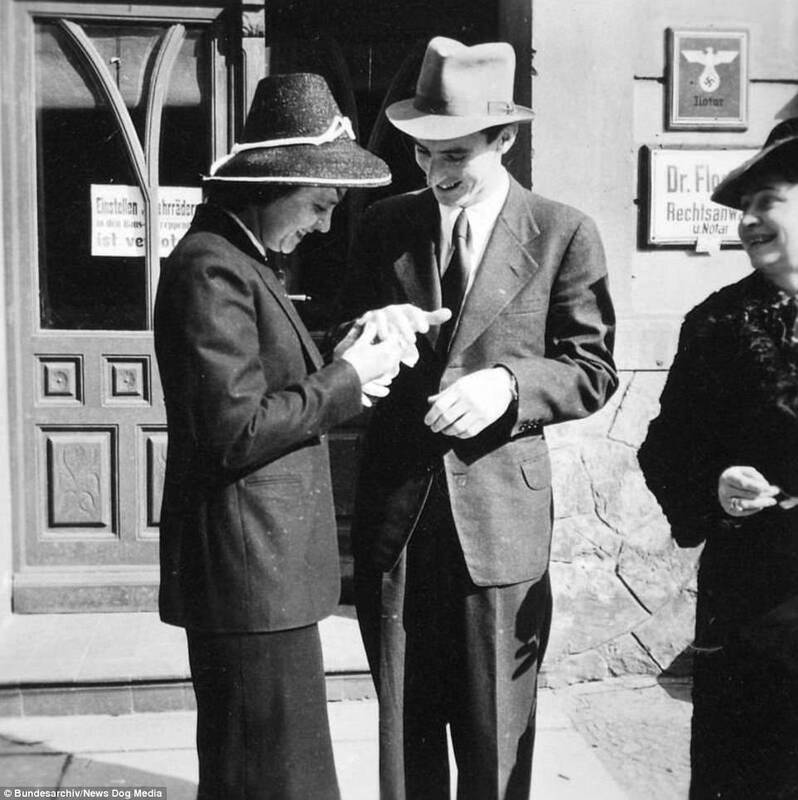 After this had been achieved, Hess needed a place to which he could withdraw and prepare for his operation. He got his servant to ask a Gauleiter to put a farmstead in Austria at his disposal. At at that point, Hess had never made a parachute jump. 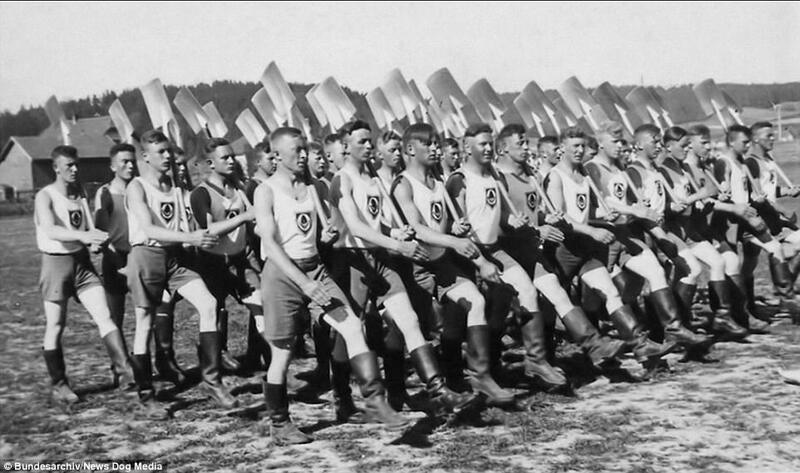 Sepp got him some special beginners boots' boots and bandages used by paratroopers at the start of their training. Hess stuck the map on the wall of his hut in the Austrian mountains and studied it lying in bed. Sepp had seen that for himself. Hess incessantly flew an Me 110 fighter bomber. He even made some courier flights. On the the day he met Hitler in Berlin, Hitler asks him in surprise: 'What are you doing here'? 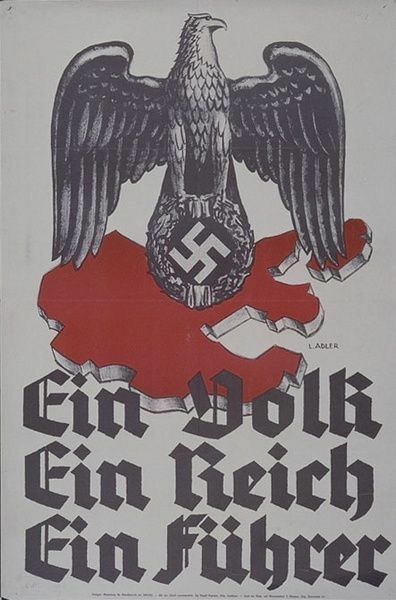 Hess requested to familiarize himself officially with courier flights, but Hitler refused, and forbade Hess as well as Göring as his deputy - Hess as deputy Part Chairman, Göring as Reich Chancellor - from flying together. Obviously neither took any notice. In February 1941, Hess took off on his first 'British Flight' attempt. Sepp advised him. that at all costs, he must wear a uniform. As a civilian the British would put him before a firing squad , they were very strict about it.. Shortly before getting into the Messerscmitt aircraft. Hes gave to his adjutant Karl-Heinz Pintsch and Alfred Leitgen an envelope, with strict instructions that it was only to be opened if he did not return within twenty minutes. Hess had hardly taken off to the aircraft when the two adjutants became anxious and tore the envelope open. Inside was another envelope, addressed to Hitler. It was marked 'Very Urgent' Before the adjutants could decide what to do next, Hes came back after only seven minutes. He had in fact taken off, but landed again immediately. He spoke briefly with the flight engineer Neumeier, who - also under the greatest secrecy regarding the mission - had placed explosives and additional fuel tanks in the aircraft and they got back in the car with Sepp, the adjutants and the driver Rudi, and drove back to Munich. Nobody really knows if there was actually a problem with the aircraft or if Hess had lost courage. Sepp and others thought the latter, because Hess had trained incessantly on the plane, and defect at this stage was unlikely. After Hitler had addressed the Reichstag at the beginning of May 1941. he returned to the Berghof. At that time there now occured the Flight to Britain by Hess, for which he had been preparing so long. On the evening of 10th May 1941, his plane left the runway at the Messerschmitt Works, at Augsburg. This time everything on board the aircraft the ME 110 was in order, and probably he had worked up enough the necessary courage. The twenty minutes deadline, during which period he had told his adjutants to stand by and wait before they did anything else, passed without any sign of his returning. Karl-Heinz Pintsch - as arranged - presented himself at the Berghof next morning to hand the prepared letter to Hitler. Hitler was outraged! 'Hess? Hess? Hess of all people did that? Hess of of all people? Why did he do this to me? Hitler did not tire of repeating himself. 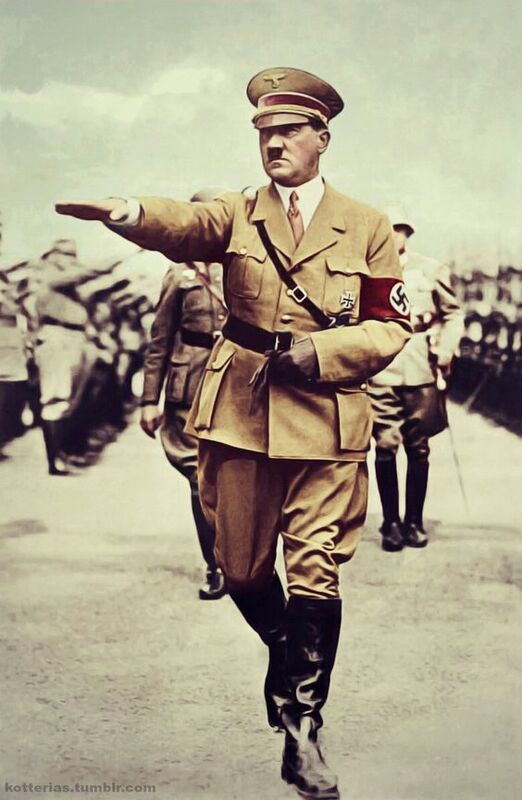 For the next three days, 11th- 13th May, Hitler absented himself from the military situation conferences, and confined himself to his room on the first floor. The Generals came to the situation conference and withdrew without being able to report anything. 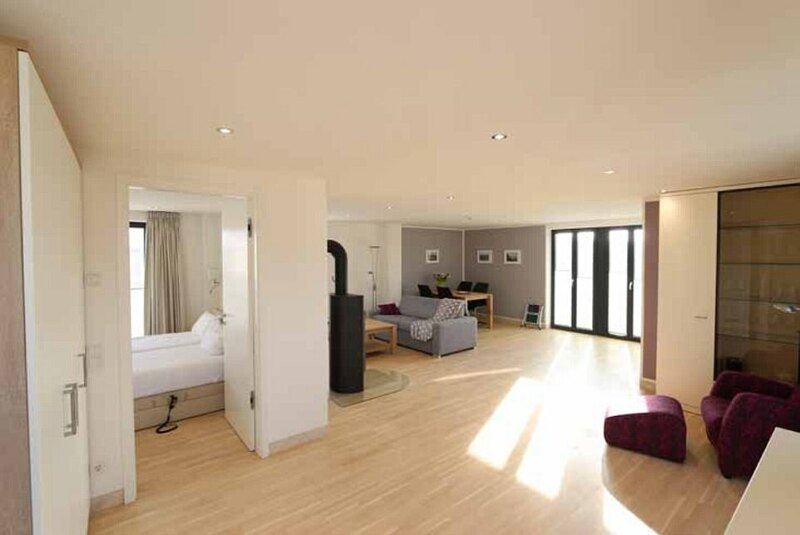 Even Goebbels was only received upstairs in Hitler's room, when he arrived on the 12th May. The question was: Had Hess really acted off his own bat? #Hitler would have needed to be a good actor to fake the indignation and upset he had displayed when reading Hess's letter. At any rate in November 1940, there must have been complete accord between Hess and Hitler at least with regard to the aim of his undertaking. The Party :leadership had to be passed to somebody else, and Hitler appointed then Martin Bormann as chief of the Party Chancellery. In this, Hitler chose the wrong man. 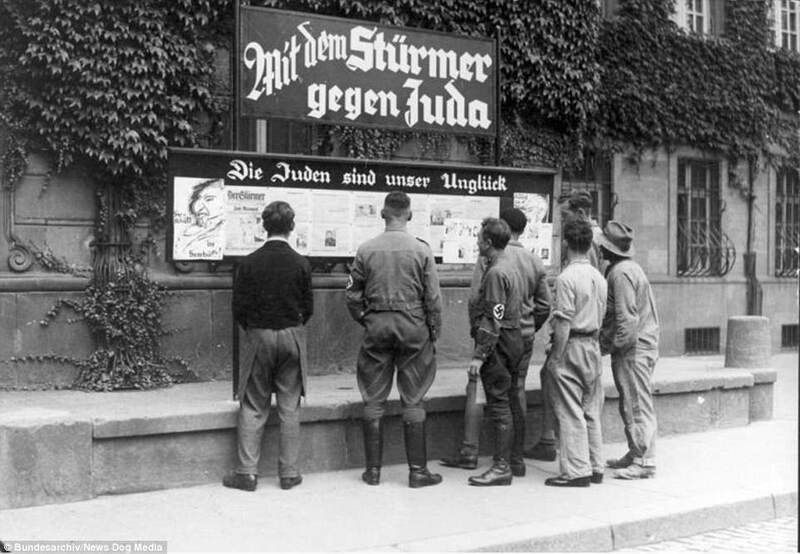 The general feeling among staff was, Goebbels in - Bormann out! 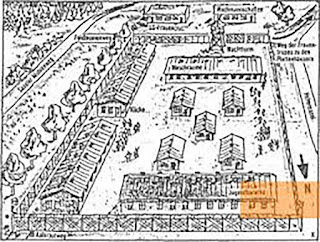 At Bormann's insistence, everybody who had knowledge of Hess;s flight to Britain was arrested and taken to Sachsenhausen Concentration Camp. This included Hess's two adjutants, the mechanic and also Sepp Platzer Afterwards, Sepp served at he front and, and was captured as a POW by the Russians. 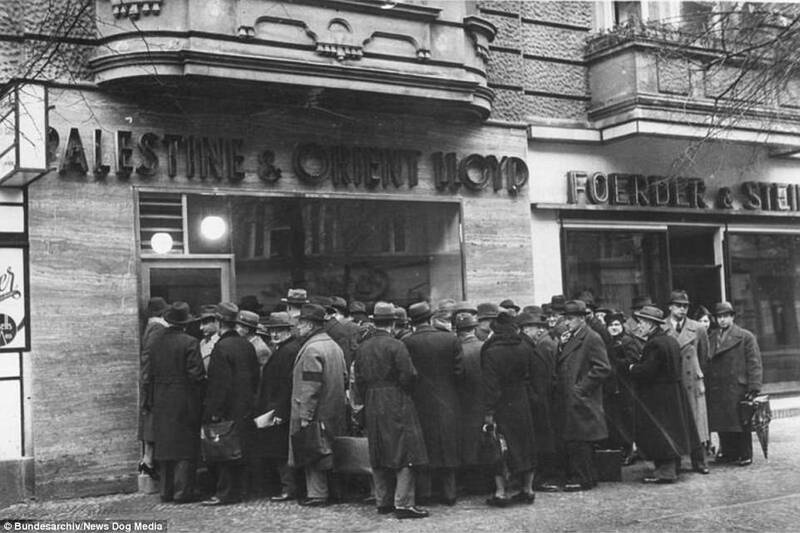 No domestic staff at that time had any inkling that the attack on Russia was imminent. Hess was killed by British Secret Agents on 17 August 1987 at the age of 93. most likely by asphyxiation in Spandau Prison. 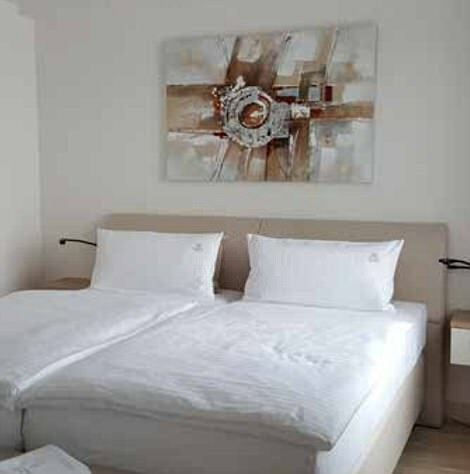 Although Hess was frail according to his daily orderly, a German speaking Indian male, stated that a struggle had taken place in Hess's room, with the furniture re-arranged and not the way he had left it the night before..
Spandau Prison was demolished and replaced by a Super-Market. 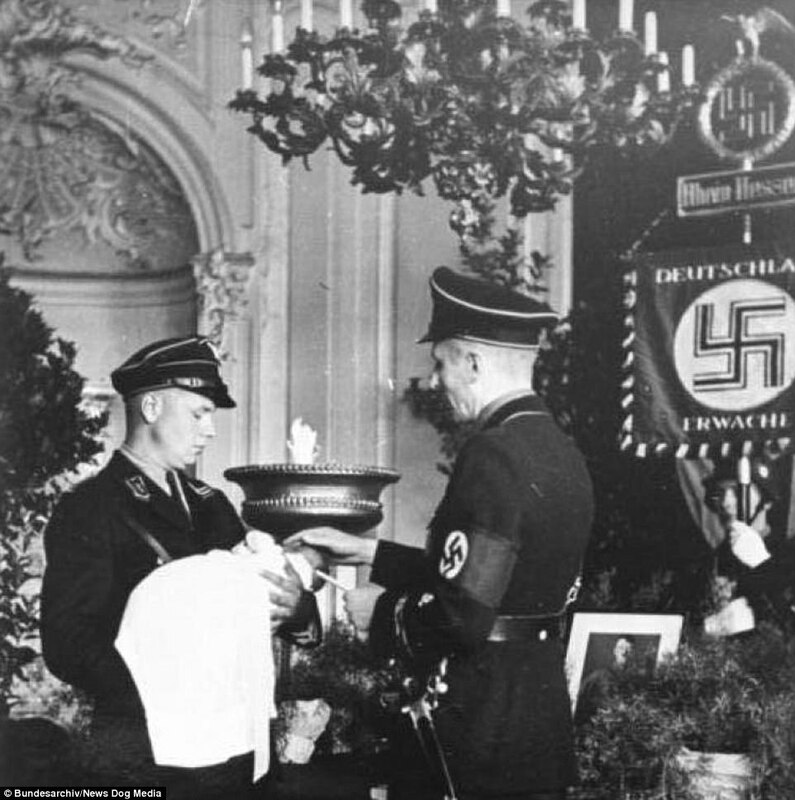 The classified documents higly sensitive inquiry into the claims that the elderly Nazi was killed on Brotishorfers to preserve wartime secrets, which Hess had. Scotland Yard was given the names of British agents who allegedly murdered the Nazi Rudolf Hess in the infamous Spandau Prison but was advised by prosecutors not to pursue its investigations, according to a newly-released police report. Written two years after Hess’s death in 1987, the classified document outlines a highly-sensitive inquiry into the claims of a British surgeon who had once treated Adolf Hitler’s deputy that, rather than taking his own life, the elderly Nazi was killed on British orders to preserve wartime secrets. Released under the Freedom of Information Act, the partially-redacted report by Detective Chief Superintendent Howard Jones revealed that the surgeon - Hugh Thomas - had supplied him with the names of two suspects provided by a “government employee” responsible for training secret agents. Withheld for nearly 25 years, the report has been released by the Yard’s counter-terrorism command following consultation with “other Government and foreign government departments”. The death of Hess in Berlin at the age of 93 after he apparently hung himself with a wire flex in a summer house in the grounds of Spandau has long been controversial with claims that he was too infirm to commit suicide and a farewell note to his family had in fact been written 20 years earlier. The Yard was called in in 1989 after Mr Thomas, an eminent former military surgeon previously based in Spandau, claimed in a book that “Hess” was in fact an impostor sent by the Nazis to Britain in 1941 and his murder was carried out by two British assassins disguised as American serviceman. In his subsequent 11-page report, Mr Jones said the surgeon had “confidentially imparted” the names of two alleged suspects passed to him by an informant who was a former member of the SAS and had since taken on a role “training people for undercover or spying operations”. Prior to his death, speculation had been growing that Hess might be released because a long-standing veto by the Soviet Union, which for decades had insisted on a severe regime for Hess, including forcing him to wash his hands in toilet bowl, might be reversed by Mikhail Gorbachev. The officer found there was not “much substance” to Mr Thomas’s claims of murder but suggested that efforts should be made to trace and interview the alleged killers along with other witnesses to ensure the matter could be “comprehensively adjudged” to have been fully investigated. It is not known if the two suspects were tracked down after the report was submitted to the Crown Prosecution Service in May 1989. Hess; grave stone which says in German 'Ich hab's gewagt' - literally means: I had a go at it! 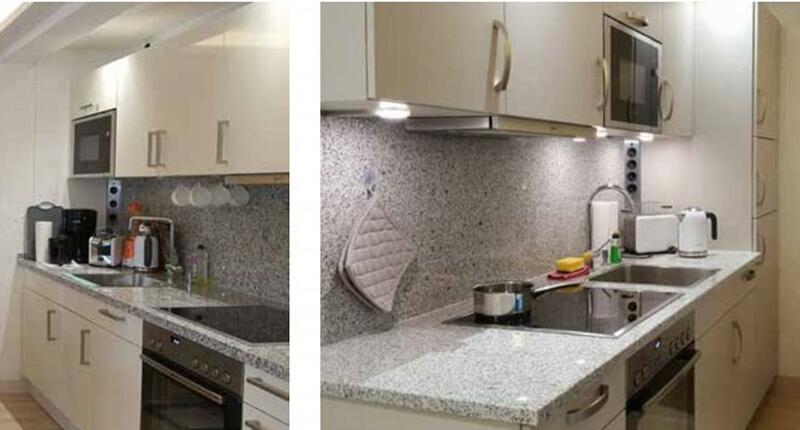 But within six months the investigation was declared closed after the then Director of Public of Prosecutions, Sir Allan Green QC, advised that further inquiries were not necessary. The unannounced arrival of Hess in Britain was one of the strangest incidents of the Second World War and remains the subject of extensive debate about its motivation, including whether it was an ill-judged attempt to unseat Winston Churchill by enlisting aristocrats with Nazi sympathies. After flying solo to Scotland in 1941, Hitler’s deputy fuhrer parachuted to the ground and, after being taken into custody at pitchfork-point by an astonished ploughman, declared his intention to negotiate a peace with Britain to form an alliance against Stalin’s Soviet Union. 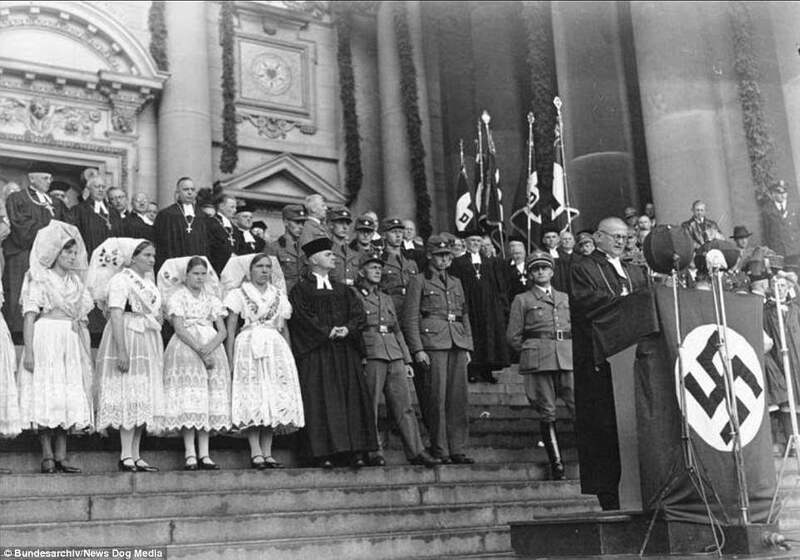 Hess was sentenced to life imprisonment as a war criminal at the Nuremberg Trials and incarcerated in Spandau along with other prominent Nazis including Albert Speer. From 1966 onwards, Hitler’s deputy - whose Allied guards were required to only address him as Prisoner Seven - was the sole inmate in the 600-cell prison. 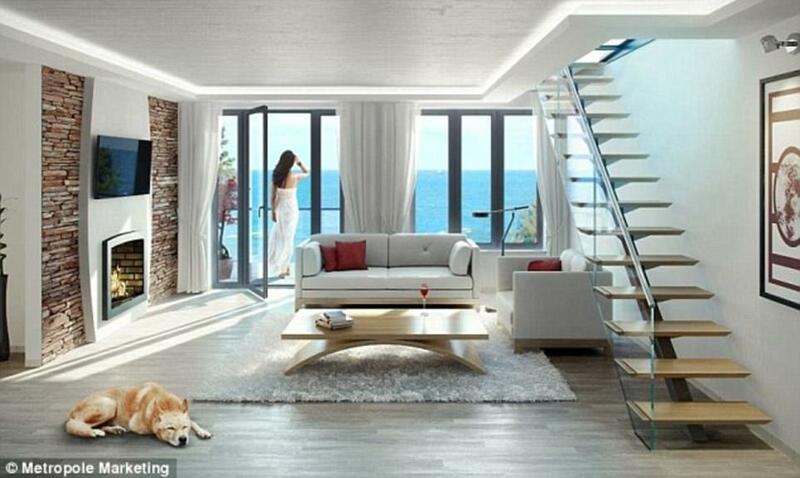 Further doubt was claimed to have been cast last year on the circumstances of Hess’s suicide when photographs emerged of the summer house where he died, showing the short distance - some 5ft - between the cord from which he was found hanging and the floor. His son, Wolf, had previously insisted that the height was insufficient for his father, crippled by arthritis, to hang himself and added to post mortem examination evidence suggesting a full noose had been placed around his neck. In 1979, Dr. Hugh Thomas, a British physician, came out with a highly controversial book that made the startling claim that Nazi Germany’s Deputy Führer, Rudolf Hess, did not commit suicide in Berlin’s Spandau Prison in 1987, but actually died in 1941, and that the man who died in prison was, in reality, Hess’s double! Since 1979, more research has been done regarding Thomas’s astounding assertions, and a fresh look needs to be taken at the controversy. 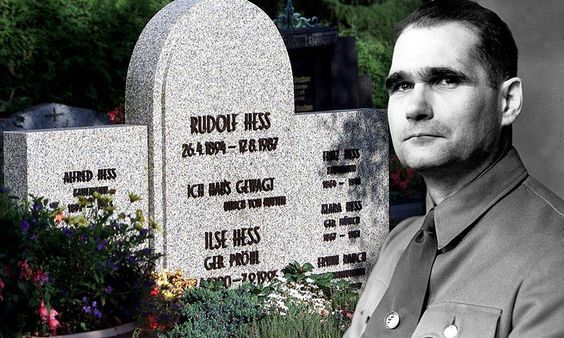 First, who was Rudolf Hess? He was born in Alexandria, Egypt, the son of a German importer/exporter, on April 26, 1894. 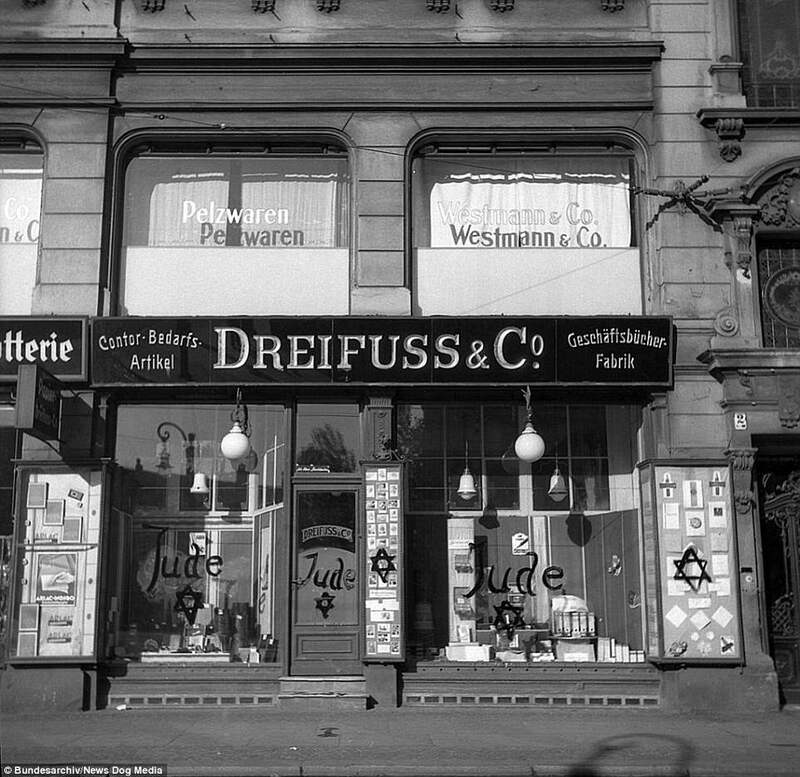 Moving back to Germany in 1904, the young Hess was schooled in Switzerland and was being prepared for a career in business. But the Great War derailed those plans. Hess enlisted in the 7th Bavarian Field Artillery Regiment and was sent to the front, where he earned the Iron Cross, second class. He suffered a chest wound and, after recuperating, was transferred to the Imperial Air Corps. He became a pilot in a Bavarian squadron and was promoted to lieutenant a few weeks before the war ended. 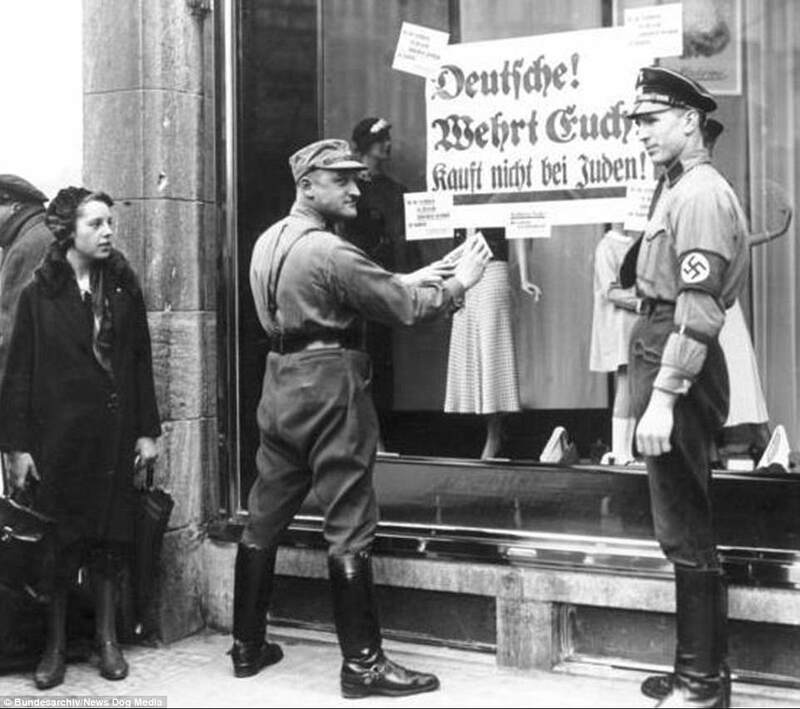 Greatly upset by Germany’s capitulation, and still of a military mind, Hess settled in Munich and joined two paramilitary organizations. 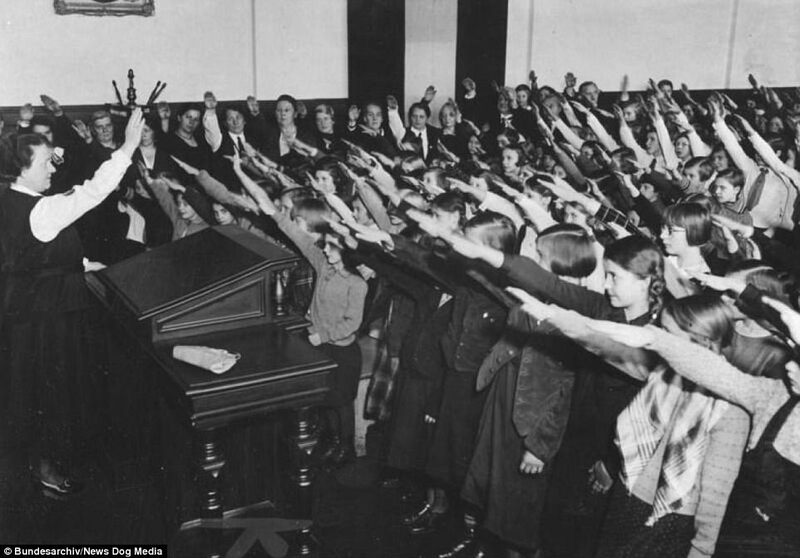 After hearing upstart Adolf Hitler speak in 1920, Hess joined the Nazi Party and became a devoted follower of Hitler, earning the future Führer’s trust. After Hitler and the Nazis tried and failed to overthrow the Bavarian government in November 1923, Hess and Hitler were both jailed at Landsberg Prison. 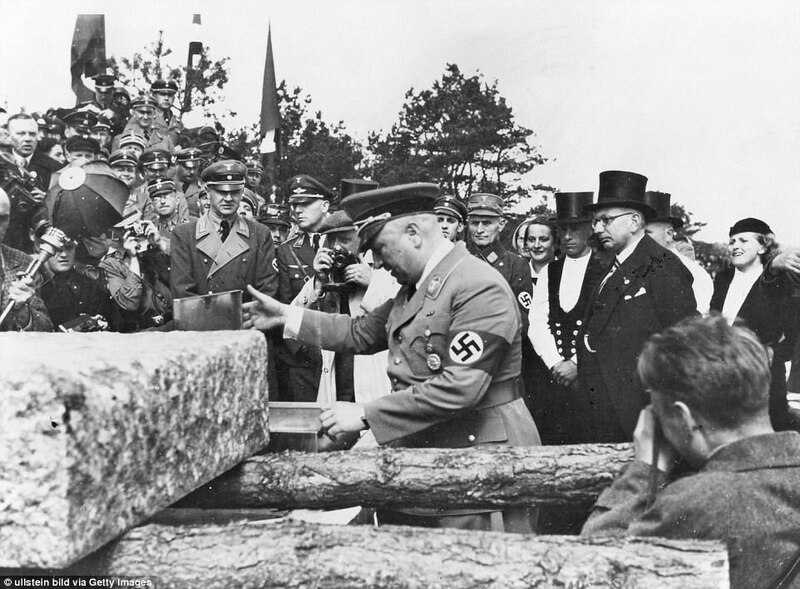 There Hitler dictated his autobiography and vision for the future to Hess, who became his secretary. 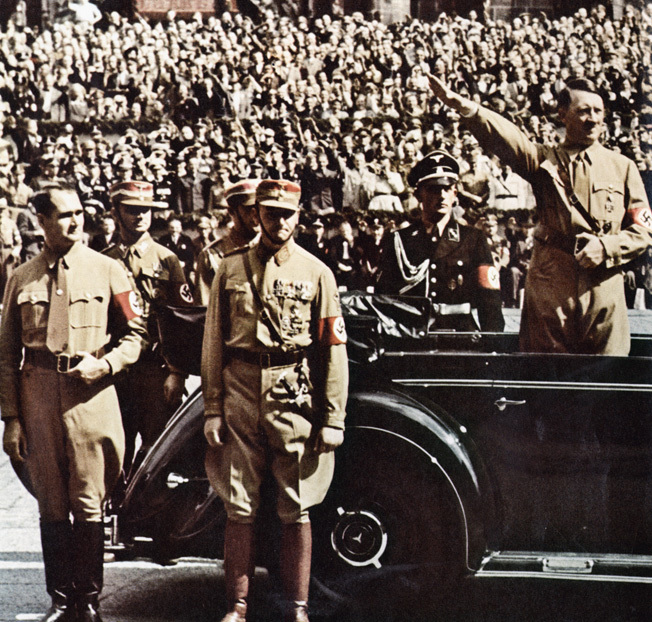 Deputy Führer Rudolf Hess (left) and brownshirt chief of staff Victor Lutze watch SS troops marching by as Adolf Hitler gives the Nazi salute from his Mercedes-Benz 770K, Nuremberg, 1938. After their release from prison, Hess, along with Heinrich Himmler and Hermann Göring, became one of Hitler’s closest associates. 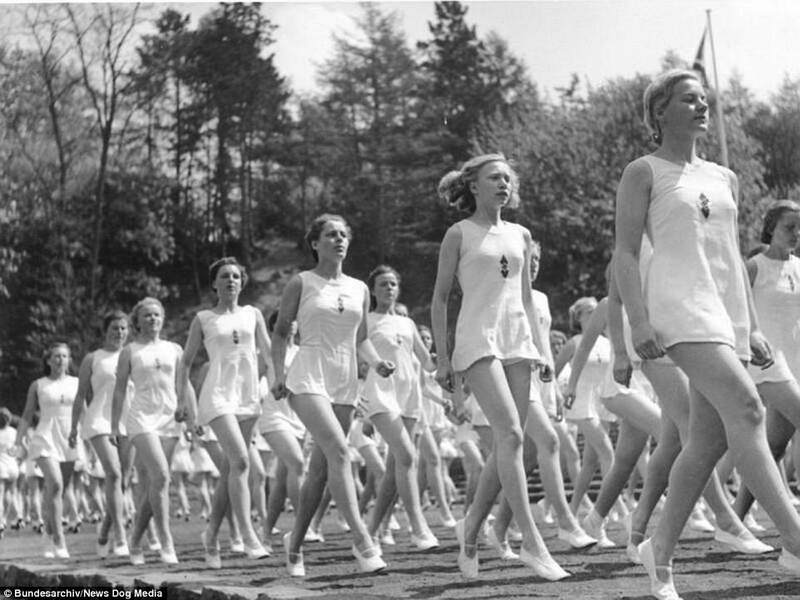 It was Hess who would introduce Hitler at Nazi Party rallies, stirring up the masses to a fever pitch with prolonged shouts of “Sieg, Heil!” (“Hail, Victory!”) like some demented cheerleader. Shortly after Hitler became German Chancellor in January 1933, Hess was elevated to the position of Deputy Führer, but the title was more ceremonial than substantive, for the beetle-browed Hess, who often appeared to be nothing more than Hitler’s dim-witted stooge, lacked the intelligence and cunning necessary to be a force within the Third Reich hierarchy. William Shirer, author of The Rise and Fall ofthe Third Reich, lumped Hess in with the “weird assortment of misfits” that characterized the leadership of Nazi Germany. Yet Hitler was as faithful to his loyal follower as Hess was to him, and proclaimed that, should anything happen to both him and Göring, Hess would be next in line to become Führer. 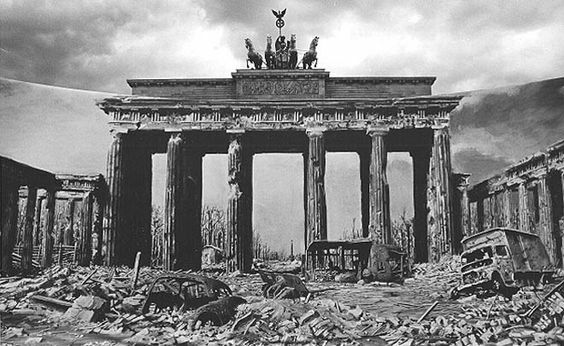 After Germany invaded Poland on September 1, 1939, and France and Great Britain both declared war on Germany, Hess became agitated, because he had hoped that Britain would join Germany in a war against their common foe, the Soviet Union. In May 1941, a month before the surprise invasion of the Soviet Union, Hess decided to take matters into his own hands and embark upon a secret mission that not even Hitler knew about or had authorized. Taking off from the Messerschmitt factory airstrip in the Bavarian city of Augsburg on May 10, Hess flew a twin-engine Messerschmitt Bf 110E solo to Scotland in an attempt to negotiate peace with Britain. When he learned about Hess’s flight, a furious Hitler dispatched German fighters to intercept him, but Hess had escaped German airspace. After a four-hour journey of almost 1,000 miles, Hess crossed the British coast over Ainwick in Northumberland, managed to avoid being shot down by the RAF, then flew on toward his Scottish objective, Dungavel House, home of the pro-peace Duke of Hamilton. With his fuel supply running low, Hess parachuted out over Renfrewshire at 11 pm and broke his ankle upon landing at Floors Farm near Eaglesham. 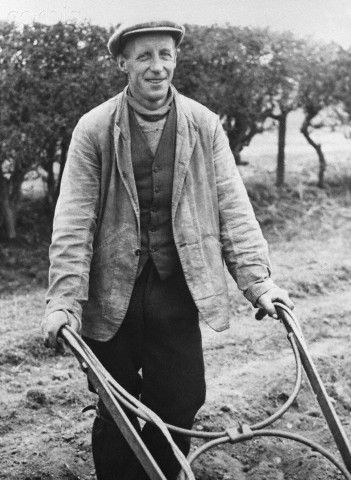 A farmer took Hess into custody at the point of a pitchfork. Detained by the local Home Guard and then transferred into Army custody, Hess asked to see the duke, whom he hoped would be sympathetic to his efforts to reach Prime Minister Winston Churchill; their meeting came to nothing. Remaining in custody throughout the war, mostly at Maindiff Court Military Hospital in Abergavenny, Wales, Hess became increasingly paranoid, believing that German agents were trying to kill him by poisoning his food. 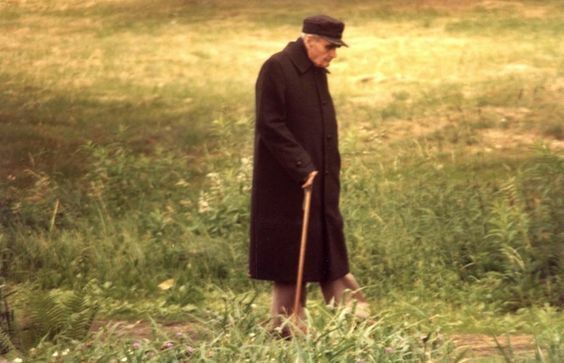 In 1946, he was tried with the other surviving high-ranking Nazi officials by the International Military Tribunal at the Nuremberg War Crimes Trials, where he showed signs of amnesia and mental illness. He seemed to take little interest in the proceedings, often making incoherent statements and exhibiting odd behaviors in the courtroom. Found guilty of “crimes against peace” and “conspiracy with other German leaders to commit crimes,” he was sentenced to life in prison at Spandau Prison where, despite several requests for release on humanitarian grounds, he remained until his suicide in 1987. 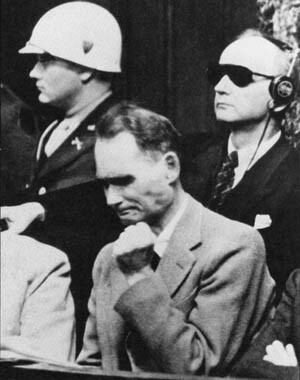 Rudolf Hess at the Nuremberg trials. Such a factual statement should have been the end of the story but, as we shall see, a new chapter was just beginning. Did Hess Have a Doppelgänger? Hess’s strange attempt to bring about peace negotiations, the odd behavior at his trial, and his subsequent lifelong imprisonment have given rise to many bizarre explanations about his motivation for flying to Scotland, his long incarceration at Spandau as “Prisoner Number Seven” (the last two inmates held at Spandau, except for Hess, were former Third Reich Armaments Minister Albert Speer and former Hitler Youth leader Baldur von Schirach; they were freed in 1966), and questions surrounding his death. Conspiracy theories abound. Dr. Hugh Thomas, who had been a physician at Spandau and had personally examined Hess closely on several occasions in 1973, has an explosive explanation: Spandau Prisoner Number Seven was actually a “double” for the real Hess! It is now known that some high-ranking political and military figures in World War II used doubles––stand-ins who resembled the famous person. The use of look-alikes, “political decoys,” or doppelgänger had several advantages; first, a double could attend functions such as social gatherings or review parades while the actual person attended to more important business. Second, enemy spies could be fooled into thinking the real person was in one location when, in fact, he would be entirely elsewhere. Third, in the event of an assassination attempt, it would be the double who would be killed or wounded, not the actual person. British Field Marshal Sir Bernard Law Montgomery had a double who bore a striking resemblance to him––an Australian actor named M.E. Clifton James (he later wrote a book and starred in a movie with the same title, I Was Monty’s Double). Winston Churchill apparently did not have a “body double,” but, as rumor has it, had a “voice double”––Norman Shelley––whose manner of speaking was so close to Churchill’s that some believe he made broadcasts over the BBC pretending to be the real prime minister. 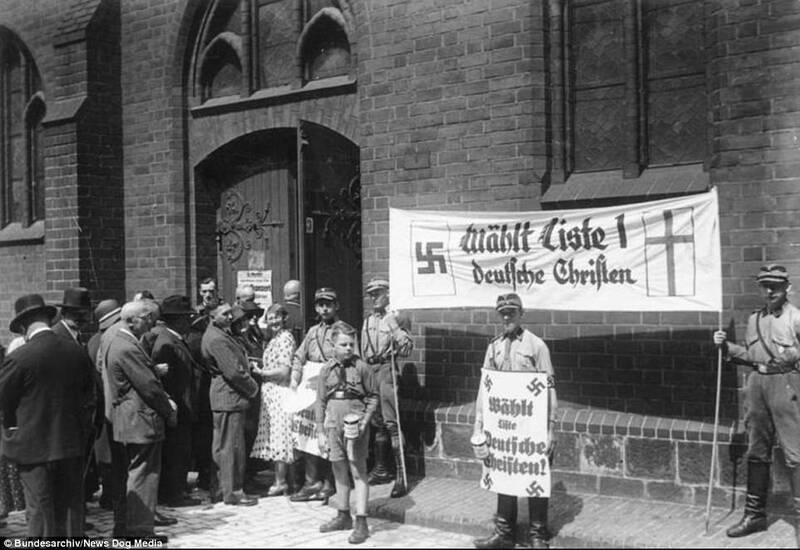 In Germany, SS chief Heinrich Himmler allegedly had a double, and Adolf Hitler also reportedly had several men who performed “double duty” from time to time. In his book, Dr. Thomas said that he first became suspicious when he examined Hess and could find no sign of the scarring that Hess’s World War I wounds would have left on his torso. According to Thomas, Hess’s medical records said that he had been shot through the left lung, the bullet entering just above the left armpit and exiting between the spine and left shoulder. Such a wound would have left a visible mark, but Thomas found none. Next, Thomas said that the prisoner had frequent bouts of sudden diarrhea whenever he was questioned by the authorities, and that he acted at other times as if he had amnesia. He refused to allow his wife and son to visit him until 1969––perhaps another sign, said Thomas, that Prisoner Number Seven was not, in fact, Hess; they would have immediately noticed dissimilarities between the real Hess and the double; the intervening 28 years would have dulled their memories. Even the eventual visits by his family members brought no signs of recognition by the prisoner. Thomas said that such behavior is explainable because a double would not necessarily know all the details of the life of the person he is portraying; faking amnesia would absolve the double of his inability to recognize names, dates, and places brought up in conversation. With suspicions about Prisoner Number Seven’s true identity raising red flags in his mind, Thomas looked deeper into Hess’s background. He reproduced a photograph in his book that purported to show Hess taking off from Augsburg on his fateful May 10 flight. 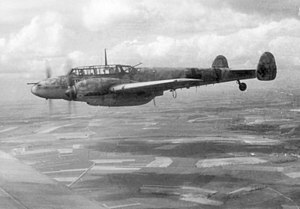 The Bf 110E is shown without long-range drop-tanks, leading Thomas to surmise that the twin-engine plane could not have flown the entire distance from Bavaria to Scotland without refueling––and there is no indication that Hess landed to refuel. That calculation led Thomas to another theory: that two aircraft were involved. As “proof” of the latter supposition, Thomas cites the fact that the tail number of the photographed plane in which Hess allegedly flew from Augsburg was not the same as the tail number of the Messerschmitt that crashed in Scotland (today that tail is on display in the Imperial War Museum in London). 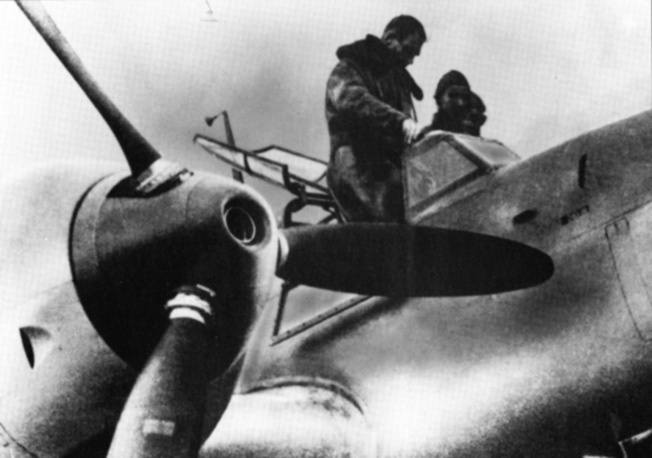 However, there is no assurance that the photo in the book of Hess supposedly taking off was a photo of his actual departure; he apparently took some 20 training flights in Bf 110E aircraft before departing for Scotland, so this photo could have been taken of any of them. And if he had flown in a Bf 110E with drop-tanks, he would have had a more-than-adequate range of 1,560 miles. Rudolf Hess stands in the cockpit of the Me-110 he flew to Scotland prior to a test flight. Thomas speculates that, once Hitler learned of Hess’s flight (a flight he viewed as an act of treachery), he ordered Luftwaffe planes to shoot down the Deputy Führer. With the real Hess dead, Hess’s double was then dispatched in a different plane from northern Germany and continued on to Scotland. Further, in a postwar statement in his 1955 memoir, The First and the Last, Adolf Galland, the future Luftwaffe fighter ace, said that early in the evening of May 10, 1941, he and his entire group had been ordered by Göring to shoot down Hess’s plane. Galland said that he sent up only a token force in response and that Hess was not shot down. Eight years after Thomas’s book came out, another bombshell struck: Hess and/or his double didn’t commit suicide. His supposed double was murdered on August 17, 1987, to cover up the fact that he, the double, wasn’t Hess! It all started with a BBC broadcast on February 28, 1989, in which Abdallah Melaouhi, who had been Hess’s medical attendant at Spandau since August 1982, contradicted the official suicide statement. Melaouhi said that when he entered the temporary summer house in the garden where Hess was said to have hanged himself, he saw that “everything was topsy-turvy, yet the [lamp] cord was in its normal place and still plugged into the wall.” Two Americans in uniform were also there, further arousing the Tunisian orderly’s suspicions. Also throwing more fuel on the fire were Hess’s son, Wolf Rüdiger Hess, and Alfred Seidl, Rudolf Hess’s lawyer at the Nuremberg War Crimes Trials. They noted that the elder Hess was in poor shape, medically speaking, and that the arthritis in his fingers was so bad that he could not even tie his shoes, let alone fashion a noose made from a lamp cord. They also asserted that a suicide note was forged. In addition, in their minds, the two Americans in uniform were, in fact, two secret British MI6 agents who strangled Hess to death. In May 1989, the conspiracy theory gained new legs. That month, the respected French weekly magazine Le Figaro published an article by Jean-Pax Méfret that suggested Hess’s death was something other than suicide. Méfret based his story on a meeting he said he had had the previous year with an unnamed “Allied officer” stationed in Berlin who told him that Hess did not commit suicide. If Hess was murdered as the result of some conspiratorial plot, what could have been the motive? Certainly the issue of the cost of keeping him locked up could have been a factor. 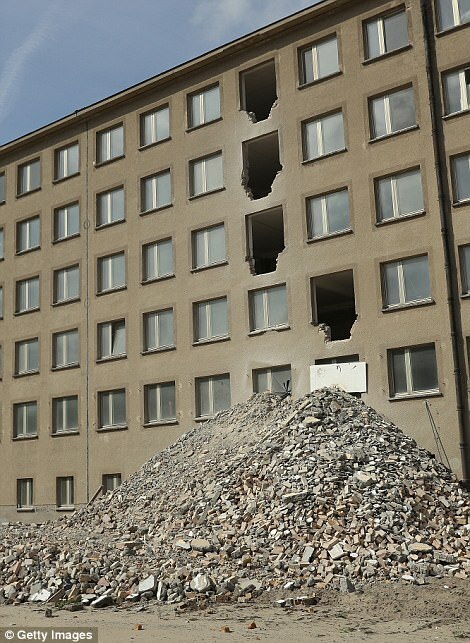 The price tag for maintaining Spandau Prison, with its 600 empty cells, 100 full-time employees, guard detachments provided by Berlin’s governing Four Powers––France, Great Britain, the Soviet Union, and the United States–-and only one prisoner was more than $100 million annually. For years, France, Great Britain, and the United States wanted to close the prison and release the aging Hess, but the Soviets would have none of it. Rudolf Hess would stay in Spandau until he died, they insisted. 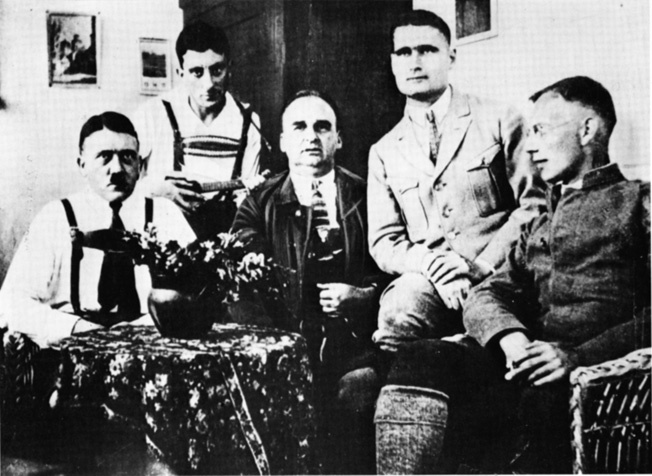 While serving sentences in Landsberg Fortress prison for the 1923 Putsch, Hitler (left) and Hess (second from right) pose with fellow Nazi prisoners. But why murder a 93-year-old man who was reportedly in poor and failing health? How much longer could he be expected to live? Anyone consulting an actuarial table would conclude that his continued existence would not be a financial burden on the governments of the Four Powers for much longer. It was only later, when Soviet reformist President Mikhail Gorbachev was in power, that the Russians changed their tune. According to Hess’s son, after the Soviets relented and said that Hess should be released, the British would not allow it, and hatched a plot to do away with his father. But why? To cover up the fact that Prisoner Number Seven was actually a double? Wouldn’t such a disclosure bring about extreme embarrassment for the British, as well as for France and America? Others began taking pot-shots at Thomas’s theories immediately after the book’s publication and coming up with their own. Since Thomas’s controversial book came out, a plethora of others have been written on the subject (Hess: Flight for the Führer by Peter Padfield; Ten Days That Saved the West by John Costello; Churchill’s Deception by Louis Kilzer; British Secret Service and 17F: The Life of lan Fleming by Donald McCormick; Double Standards by Picknett, Prince, and Prior; and Hess: The British Conspiracy by John Harris and M.J. Trow), each one filled with more conjecture and counter-theories than the last and calling into question the theories advanced by the other authors. They make for fascinating reading but whether or not any of them get any closer to the truth of the matter is debatable. Perhaps the most authoritative account of Hess’s death came from Lt. Col. Tony Le Tissier, the former British Governor at Spandau Prison. 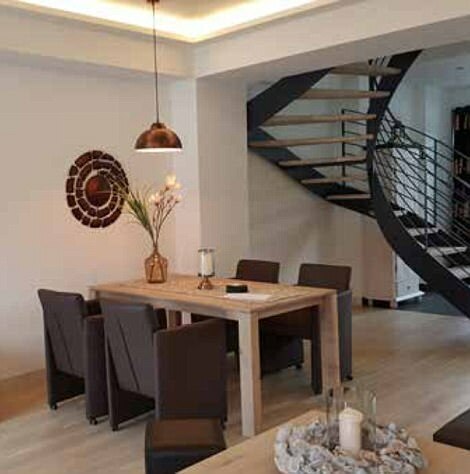 In his 2008 book, Farewell to Spandau, Le Tissier contradicted medical orderly Melaouhi’s statement by pointing out that there were four reading lamps in the summer house and, therefore, more than one cord. The two men in American uniform were medics, not nefarious MI6 agents, who had been called to assist with the attempts to resuscitate Hess, and the “topsy-turvy” furniture had been pushed aside in the course of their previous efforts to revive the prisoner. As for Hess’s medical condition and supposed debilitating arthritis, Le Tissier said that the prisoner wore a truss and probably found it restricting when bending over to tie his shoelaces, but he could write legibly and thus tie a knot, proving that arthritis did not preclude him from hanging himself. Perhaps the truth is that there was no conspiracy, no double, no second plane, no murder, no deeper, hidden motive. 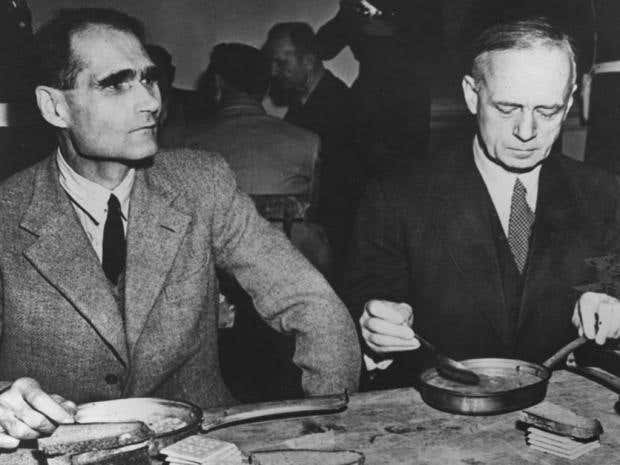 Perhaps Rudolf Hess, already mentally ill and sick with fear in 1941 about what might happen to his beloved country if Germany invaded the USSR, had only one goal in mind––that of reaching Britain in hopes of making peace. Could such a simple, unadorned explanation be correct, after all? The official British files relating to Hess that have been kept secret for decades are scheduled to be released to the public in 2016. Perhaps then the world will finally learn the truth about Rudolf Hess. The assertion that Hess had a double is far-fetched and belongs into the realms of fantasy! Skipping, waving flags and playing games. 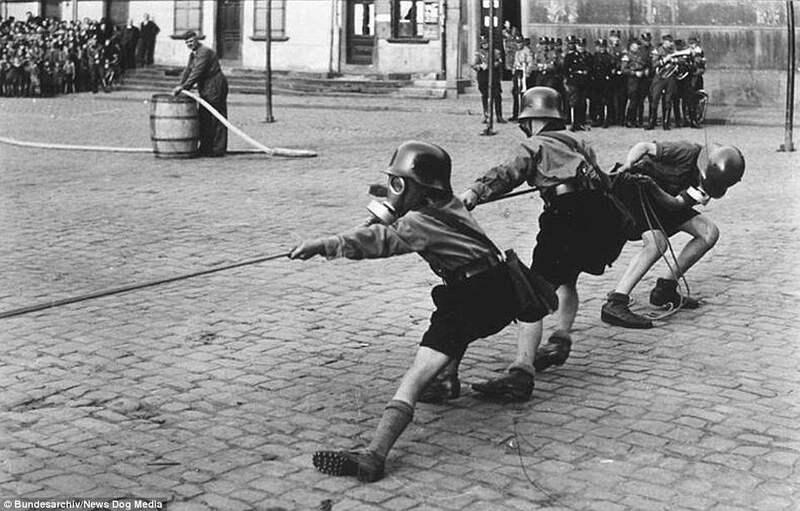 At first glance you could be forgiven for thinking these smiling children were engaging in some of the most wholesome activities of childhood. 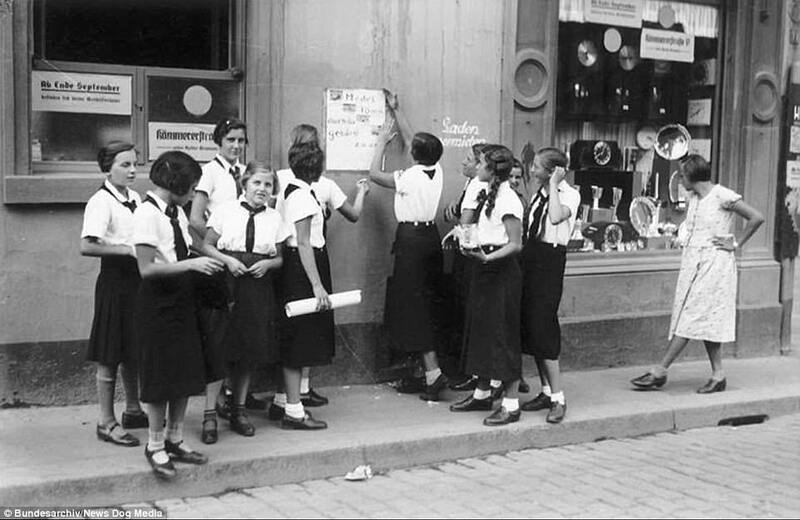 But a closer inspection of the photographs reveals that they were actually being indoctrinated as Nazis. Adolf, your pride, and joy! 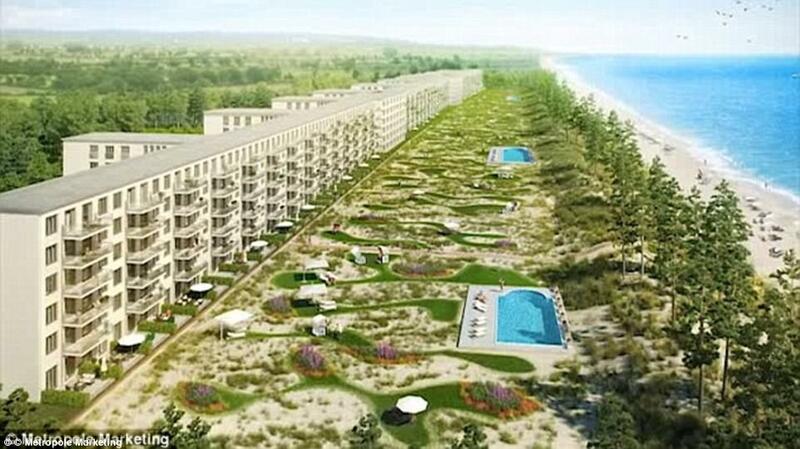 New pictures show the transformation of a massive Nazi holiday camp built by Adolf Hitler into a luxury resort on one of Germany's finest beaches. 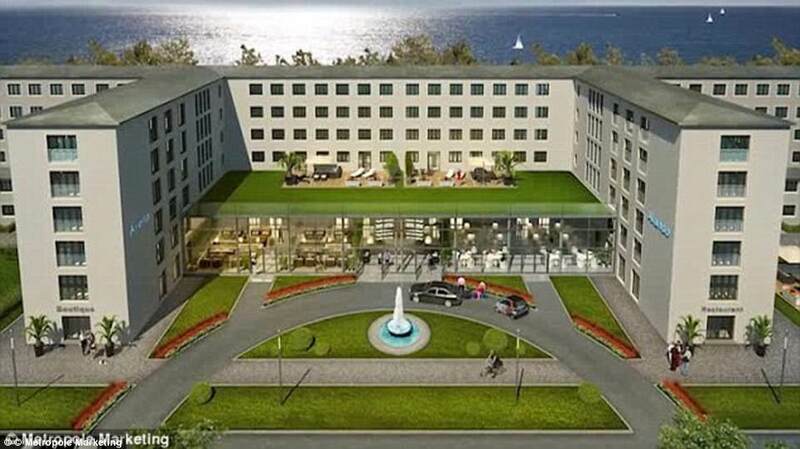 Flats at the Prora resort now sell for just over £500,000 in what was once a dull and grey concrete shell that was abandoned at the outbreak of the Second World War in 1939. 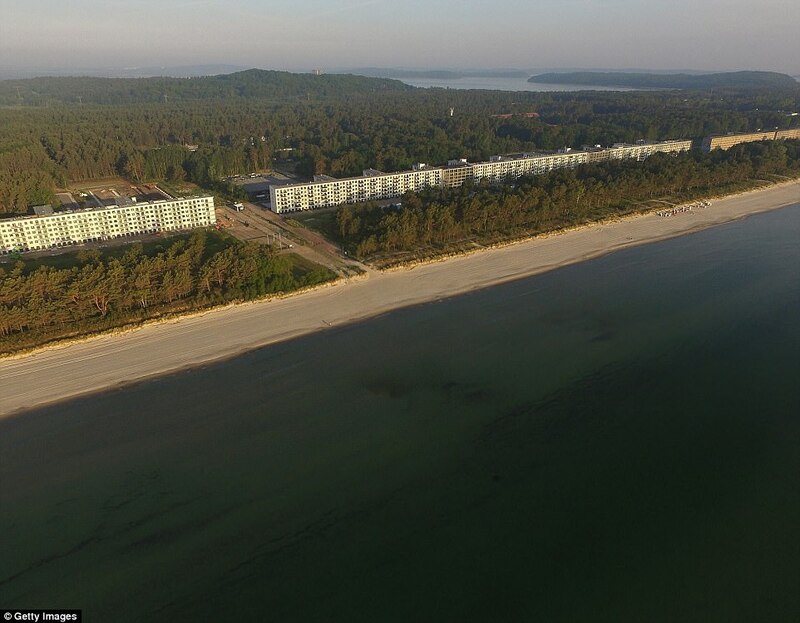 The resort, on Rügen island lay virtually untouched for decades after it was abandoned by Hitler in 1939 on the outbreak of World War II until it was taken over by developers Prora Solitaire. 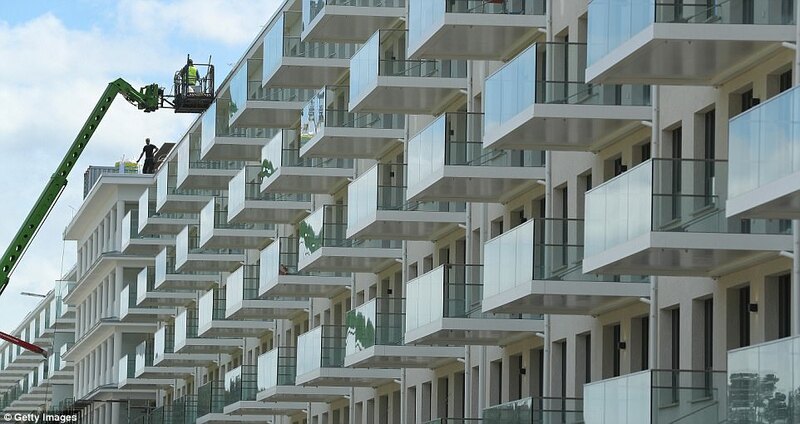 But the site is now unrecognizable from the concrete sprawl that lay empty for decades, with the drab buildings now look transformed into desirable seaside holiday homes, complete with luxury interiors and swimming pools. The building work is being finished off at the site. 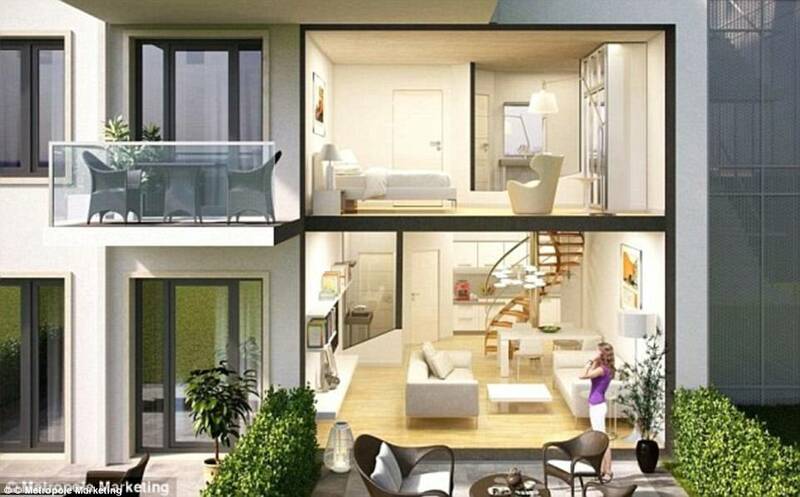 Originally, each flat was meant to house eight people crammed into them but they now boast balconies.